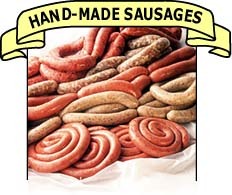 Try Ricky the Butcher’s famous hand-made sausages – dispatched to you fresh on the day they are made. All of our sausages are hand-made daily in our Farm Shop, using only fresh meat and fresh market herbs and spices. Natural Skins are cured on our own farm.